Posted on January 17, 2019 at 11:35 am. Posted on January 4, 2019 at 10:00 am. While 37% of the men within the sample reported “always” reading reviews before interacting with a business, only 15% of women reported doing so. Meanwhile, 29% of men polled reported only “occasionally” reading reviews, while 45% of women did so. As Jamie noted, this implies that businesses with a male customer base need to be thinking about their review profile online. Too small a sample: it could be the case that the women being polled just happened to place less importance on reviews, or visa versa for the men, and this doesn’t reflect reality. I’m looking forward to next year’s survey to see if these results are replicated. Women rely on other avenues of research: To really bury myself in stereotyping here, beauty products come to mind as an example. It could be the case that with something like makeup, women trust friends or social media influencers more than they do reviews. The men polled inflated their answers due to some societal/psychological stuff I won’t pretend to understand: Perhaps men feel more pressure to play the role of a responsible shopper than do women and this was reflected in how they answered survey questions. Regardless, let’s explore the implications assuming this sample accurately reflects consumer’s review behavior. Another finding of note within BrightLocal’s study is that more men reported having been asked to leave a than women. When asked “Have you ever been asked to leave a review for a business?”, 54% of men selected, “Yes, and I did leave a review”, while 37% of women responded the same. Perhaps unsurprisingly, 25% of men selected, “No, I’ve never been asked”, while 44% of women responded the same. Meanwhile, 21% of men and 20% of women responded with, “Yes, but I didn’t leave a review”, respectively. Ask women for reviews: The biggest takeaway for me from this finding is that ONLY 37% OF WOMEN HAVE EVER BEEN ASKED TO WRITE A REVIEW. From an online marketing perspective, this is astonishing. I urge each of my clients to make a policy out of asking for Google reviews from every one of their clients (assuming the relationship is good). To hear that 44% of women have never been asked to write a review is astounding. Additionally, assuming your customer base is an even spread between men and women, it’s a good idea to have a representation of your female clientele online for potential customers that are also female. My intuition tells me that women relate better to the testimonials of other women when shopping around, and vice versa for men. Given that a smaller percentage of the women that were asked to leave a review did so, this is something to take into account when assessing your review profile to make sure women are represented. It should be noted that as with most things SEO, there’s debate around just how valuable online reviews are, and if you’re getting them, which platforms glean the most value per review. That being said, not one of these voices is suggesting that reviews have no value or aren’t worth having and asking for. Ask everyone for reviews: Looking at the last bullet, the same applies to men. 44% of women responded as never having been asked to write a review, while 25% of men responded in kind. That’s still a lot of men, and a lot of missed opportunities for reviews. The most surprising finding from BrightLocal’s survey is how often potential clients read businesses’ responses to reviews. According to the survey, when asked, “When searching for a local business, do you read businesses’ responses to their reviews?” men responded with the following: “Yes, always” (37%), “Yes, regularly” (27%), “Yes, occasionally” (27%), “No, never” (9%). Women responding with the following: “Yes, always” (20%), “Yes, regularly” (24%), “Yes, occasionally” (43%), “No, never” (13%). What this tells me, above all else, is that people are interested in businesses’ responses to reviews. In the likelihood that an irate customer leaves a scathing review with less than the full story, don’t let that be the full narrative potential customers see. If you respond with the full picture (e.g. If you remember one thing from today, let it be this: reviews are important, ask ALL your clients to write them. If you can remember two things, also remember to respond to exceptional (in the good or bad way) reviews. Posted on December 31, 2018 at 3:18 pm. Google announced a new site plugin that plans on making many aspects of web admins and business owners jobs more streamlined and efficient. This new plugin dubbed Site Kit by Google will be a free, open source plugin that will incorporate many different Google tools and products into one easily readable dashboard. A perfect location to check on the health of your site. In the first release of the plugin, Google has integrated four tools. Here is what Google currently says will be available on the dashboard. Search Console: Learn how users discover your content on Google Search. Analytics: Understand how users navigate your site. AdSense: Set up AdSense and monitor your earnings. The plugin will also include deep links to Google tools and advanced reports. Site Kit will begin Beta testing in early 2019. Mockingbird will keep our eyes out for the release of the full plugin later this year and will keep you updated as more information is released. Subscribe to our Newsletter to stay informed on this and many other aspects of the legal marketing industry. Posted on December 31, 2018 at 11:55 am. Almost every law firm has a dedicated person answering their main phone line, but not many are regularly auditing their calls. The initial touchpoint for a potential client is a crucial step in whether or not they’ll hire you, so why wouldn’t you put the same time, money, and effort into intake training as you do for the marketing that drives those calls to you in the first place? As a marketer, it’s my job to drive calls to your office. What happens when they contact you is completely in the hands of your intake team. I’ve had multiple conversations with clients who believe their intake process is superb, only to call in myself and have a less than favorable experience with their gatekeeper. If I have a bad experience, potential clients are also having a bad experience, which means they’re probably not going to hire you. Which ever method you choose, continue to be involved with your intake team. Your intake team is the first personal connection made on behalf of your firm, make sure it’s a good one. Posted on December 27, 2018 at 4:23 pm. It’s already hard enough getting people to your site, so once you’ve succeeded in having a prospect click an advertisement or organic result, you want to do everything you can to convert them into a client. At the least, you want to have a chance to see if they’re a good fit for your services. Unfortunately, one of the tools that’s supposed to make it as easy as possible for people to contact you can have the exact opposite result you’ve intended. Offering a “chat” option on your site, when done poorly, can absolutely kill your conversions and send your bounce rate through the roof. We’ve written before about how you should be very cautious with the way chat is implemented on your site. However, one recent incident noted by Premier Law Group, highlighted the importance of carefully monitoring any changes to your chat script. Premier Law Group has managed to keep their bounce rate somewhere in the neighborhood of 20-25%. This means that only approximately 1 in 5 visitors leave the site without viewing more than one page. It’s pretty annoying, but only takes up the upper portion of the screen. 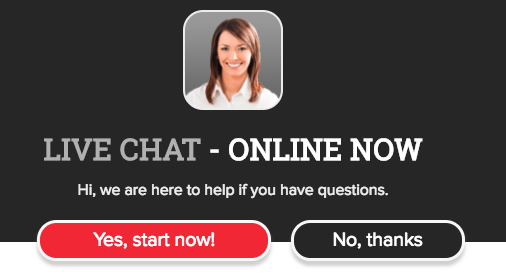 Following negative feedback from users about the annoyance of having a chat bar cover the top of the screen by default, the firm attempted to mitigate this by immediately displaying the chat popup and allowing users to clear it if they didn’t want to use the feature. It had the exact opposite result of what they’d hoped. Can you tell which day they changed the chat interface to a full screen popover? There’s been plenty written about the SEO dangers of using pop-ups, but this highlights exactly how poor the user experience is when you aggressively push something that’s only useful to a very small percentage of visitors. Premier Law Group was savvy enough to immediately catch the jump in their bounce rate, concede that the well-intentioned change was a bad idea, and revert to the previous chat display. The full screen takeover was live for a few days, and immediately following the change back to the old version, the bounce rate settled back into the 20% range. The eventual compromise was to move the chat display to the bottom of the screen, so at least the top navigation is accessible when it’s being shown on arrival. Ultimately, whether the additional conversions from chat is worth sacrificing user experience is a question every firm should think about prior to implementation. However, once you decide to add chat on your site, be very careful about how it’s displayed or you might be doing a lot more harm than good. Posted on November 27, 2018 at 9:45 am.